Bring out the glamorous rocker side of your personality with this clutch accentuated by chained detailing. Gentle dark gold ''RR'' RIONI monogram printed against a solid brown colored designer canvas body. Punctuated with gold hardware. 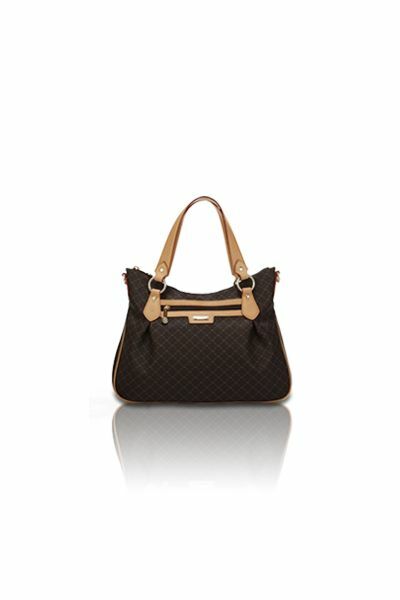 Coffee brown RIONI monogram print lining. Features leather trimming, gold hardware, and a button snap closure. Rear pocket. Organization should come simple as the interior features four compartments, with the top flap zippered pocket to the second bottom compartment being a built-in zippered wallet. Holds up to 8 cards in their respective slots. L8.5 x W2 x H5.5"
Product: Mini Crossbody Clutch was added to cart.